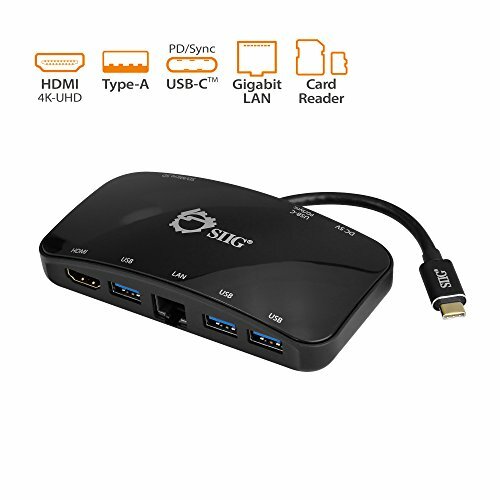 SIIG's USB-C Multi-Function 4K HDMI Video Mini Dock with PD Charging expands a single USB-C port from your MacBook, Chromebook, HP and more to multi-function outputs with HDMI, USB Type-A, USB-C (Charge and Sync), Gigabit Ethernet and SD/Micro SD card connections. It lets you connect your laptop with USB-C port (DisplayPort signal) to a HDMI display with 4K UHD resolution and 7.1-ch audio supported for stunning video images and high-fidelity sound quality. Three standard USB 3.0 Type-A ports are handily provided for connecting multiple USB powered devices such as mobile phones, mp3 player, flash drive or digital camera and more. It also allows you to charge or sync your laptop via the USB-C port to keep your computer fully powered or synchronized. One Gigabit Ethernet port is also available to access fast and reliable wired network connection. Has built-in DC power jack provides an option to connect to an external power source as needed (power adapter is not included). This user-friendly plug-n-play mini dock is compact and lightweight to travel with. It is a versatile tool for home, office or on-the-go to enhance your computer's connectivity performance for greater efficiency and productivity.